Double-click to see this picture in more detail. I got this poster in 2nd grade through the Scholastic Book Club, and it stayed on my wall until junior high, which is, of course, when everything became instantly uncool. I dutifully flipped sides depending on which scenario was more pertinent, because my life was pretty much divided between urban and rural. Post-divorce, my mother and I lived in Black Jack, MO with frequent trips to see her mother who lived in North St. Louis until she died in 1992. My father moved to a 10-acre ranch outside Alton, Illinois, and the last weekend of every month found me playing farm girl with my own horse and dogs and cows. I understood the details of the different settings, had appropriate wardrobes for each, and thought it perfectly natural to live this city/country duality. I always thought the Farm Picture was a bit fantastical. Life on my Dad’s farm was not this crowded. Squirrels did not run down the tree toward a dog, puppies and kitties did not peacefully coexist in such close proximity, and farm animals did not walk loose in the front yard. 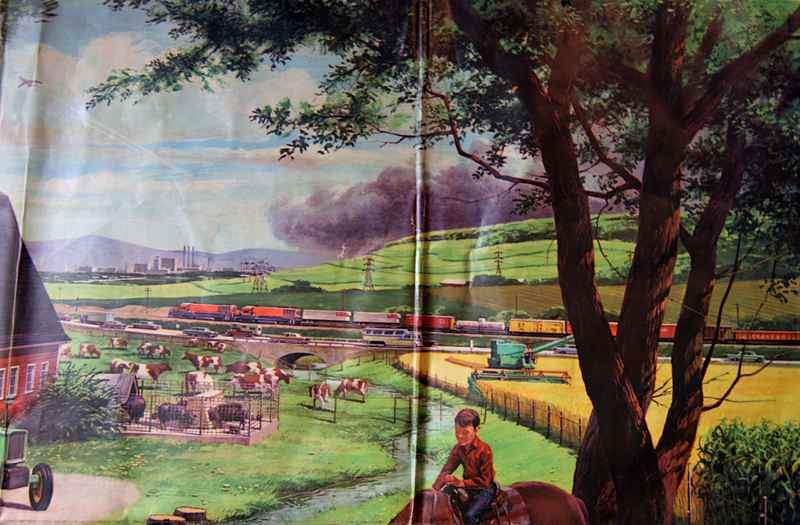 Look how much is going on in the top right quadrant: farming a field, a rural highway, a train, the Big City across the valley and a heinous storm rapidly rolling in. Those storm clouds always bothered me. I was never afraid of storms until seeing them in the unprotected fields of Illinois. And I knew firsthand that if a storm of that intensity was that close, all those animals would not be casually meandering around the front yard. They’d all be under trees in the lowest spot of the property. 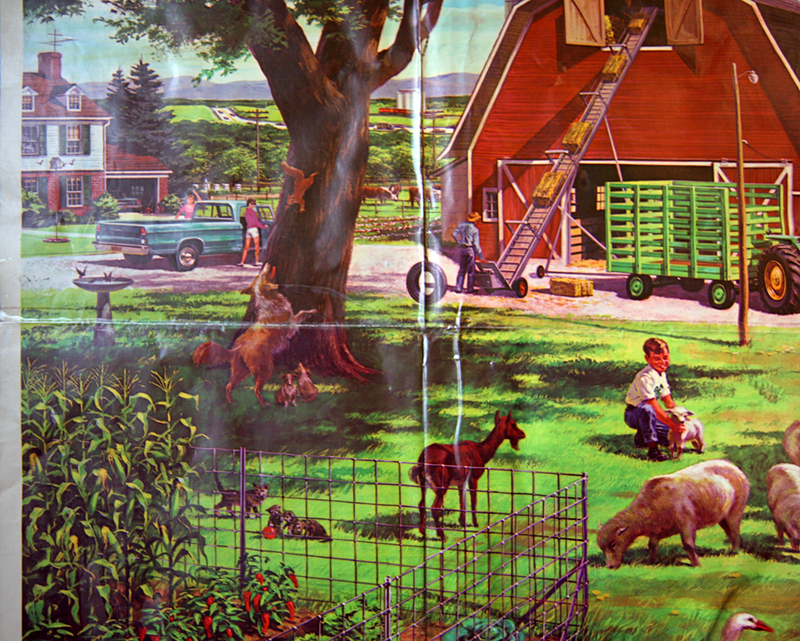 So, the Farm Picture was way busier and far more surreal than the reality of rural life. 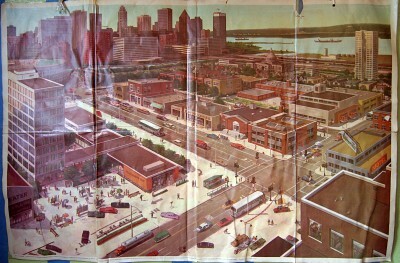 Which is why I preferred the City Picture. 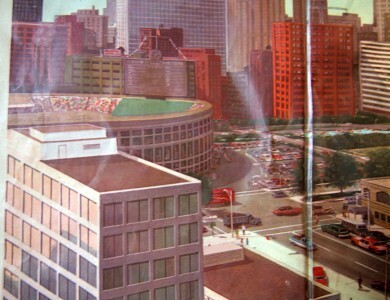 We had a stadium that looked like that one, and similar looking skyscrapers pretty much positioned in the same place. So did a lot of other cities; this was real life. 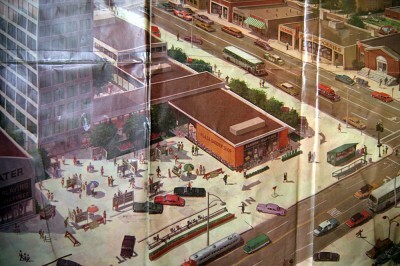 There is so much going on within the City Picture; the more you look at it the more you see. 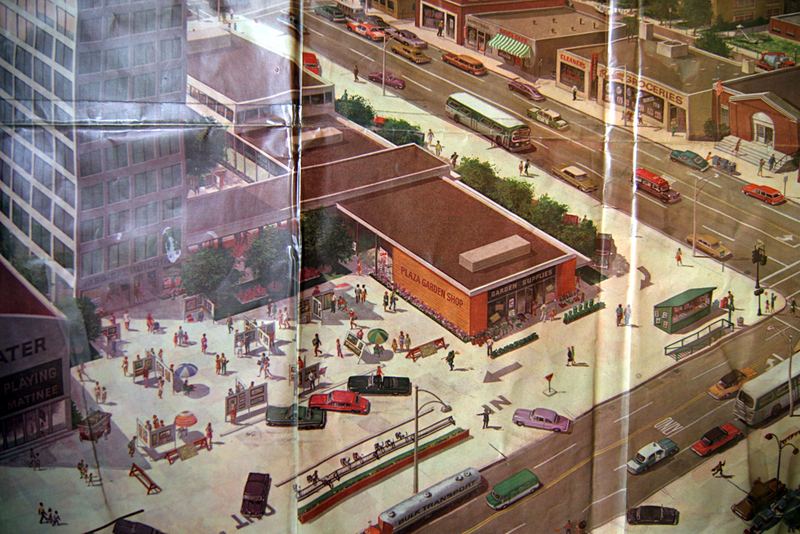 Within the bottom left quadrant are the following places: movie theater, medical building, garden shop, newsstand, record shop, dress shop, post office, grocery store, cleaners, cafe, barber shop and sporting goods shop. There are lots of people, both men and women (rather than the token female in hot pants on the Farm side) and it’s a natural bustle rather than manufactured. By 1972, this view of a city was already idealistic and nostalgic, but it’s such a compelling idea that we can’t let go of it. Urbanistas are always wanting to return to that place, and now that I have the poster back up on the wall, it is the only side showing. 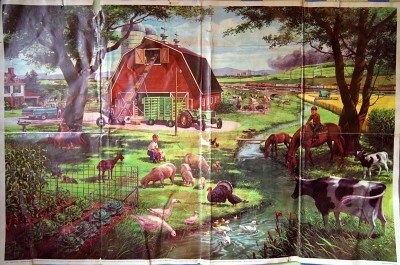 This entry was posted in observed and tagged rural, scholastic book club, urban by Toby Weiss. Bookmark the permalink. Can you email me what it says in the small print? (If you still have it). I have been looking for this poster for many, many years. I had it on my wall when I was a child! I’m now 43 and miss the nostalgia of it all. 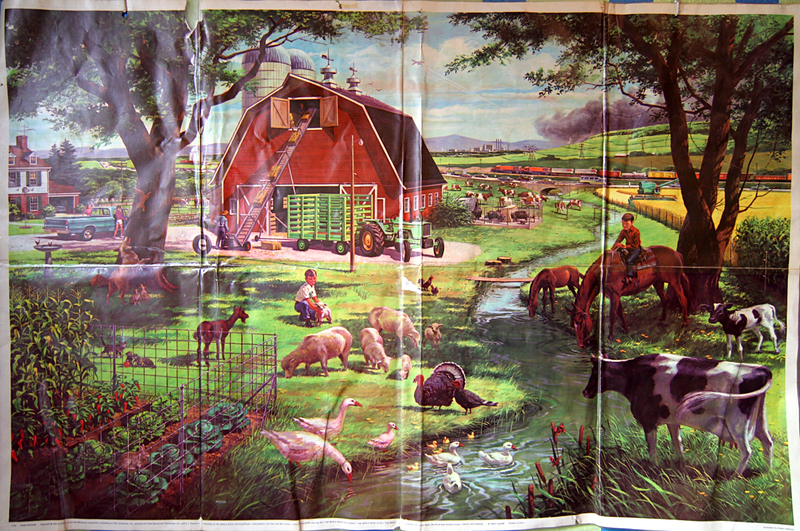 I couldn’t remember much of the detail, I just remembered that it was a two-sided poster with a farm on one side and a city on the back, and the illustrations looked like they were circa 1950’s or ’60’s. Thanks for putting images of the poster on your site so Google images could search it! Now I just have to find out how to purchase one if still available! I also had the poster on my wall 35 years ago. It is nice to finally see it again. I have been looking for something similar for my own kids. Thanks for posting those images. I remember seeing them as a kid, some 35+ years ago. I am about to start on an illustration project and I was thinking back to illustrations that stuck in my mind, and these two were there. Strangely, my own memory remembers them a bit differently but the fact that they left an impression on me after all those years tells me they were affective. 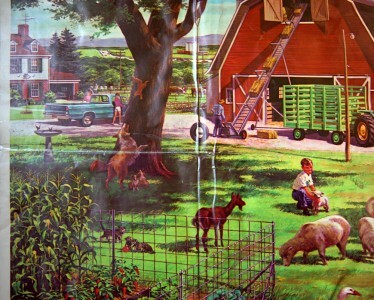 I just about had a psychological breakdown when I saw the “rural life” side of the poster. That’s the life I romanticize about when I get to feeling like I don’t belong in the metro mix anymore. To me, this is how life should be. Urban, city life, and not too far outside of the city rural life for relaxation, pleasure, etc. This “stuff” in the middle just needs to disappear.